Further to Fluoride's Impact on Brain - Focus of Two Conferences and IQ of your child! 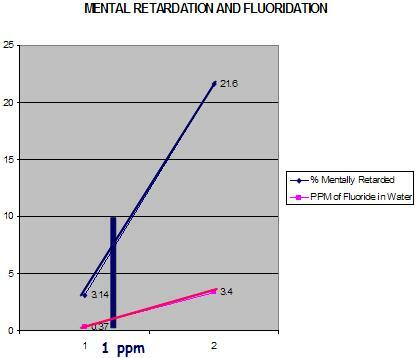 The following extract from the ISFR August 2008 Conference by Bill Osmunson DDS, MPH clearly shows increased mental retardation due to fluoride - one needs to be mindful of the of the fact that this shows a drop in IQ of all children but is easily overlooked in most with normal to high IQ. On the flip side, this needless, retardation clearly comes at the expense of those who could be potential genius' in our society - quite a price to pay! 2. Lu Y, Sun ZR, Wu LN, Wang X, Lu W, Liu SS. Effect of high-fluoride water on intelligence in children. Fluoride 2000; 33:74-8. 2 Li XS, Zhi JL, Gao RO. Effect of fluoride exposure on intelligence in children. Fluoride 1995;28:189-92. 3 Zhao LB, Liang GH, Zhang DN, Wu XR. Effect of a high fluoride water supply on children's intelligence. Fluoride 1996;29:190-2. What follows is a dramatic example on the effects of Fluoride on children. Dr. Doris Rapp, MD, FAAA, FAEM, FAAP,Pediatric allergist and environmental medical specialist discusses one of her patients, an 8 year old girl who becomes depressed from ingesting fluoride. After removing fluoride from her diet, this child's IQ went from 57 to 125 over a period of about 1 year, and her depression disappeared. The above is Video #9 on Dr. Rapp's Website. The National Academy of Sciences did a thorough review on fluoride in 2006. They documented numerous deleterious effects of fluoride on many organ systems including increased potential risk for bone fractures (the well characterized disease of skeletal fluorosis) possibly increased risk of osteosarcoma, reduced IQ, thyroid dysfunction, endocrine dysfunction and others all 300 pages is online if anyone cares to confirm it. Of course don't forget fluoride induced dental fluorsosis (i.e. teeth mottling and a sign of toxic exposure to fluoride) They ended with recommending that the EPA should more strictly regulate fluoride. Their findings mirror those in the peer-reviewed medical literature, while Harvard trained toxicologist Phyllis Mullenix also extensively documented behavioral changes in mice upon exposure to blood levels of fluoride not far greater than those experienced through water fluoridation and other sources of exposure. Former, well credentialed EPA scientists have been fired for bucking the political line on this issue. Meanwhile 90 of the fluoride placed into our water supply is not industrial grade sodium fluoride, it is silicofluorides, quite simply, scraped from the sides of Florida phosphate plant smokestacks. If it weren't thrown into the water supply it would have to be disposed of as hazardous waste. You can read more on this starting here http://healthjournalclub.blogspot.com/2009/11/water-fluoridation-part-i.html if you suspect I am just making this all up.